Happy Fourth of July, St. Louis! Celebrate America’s birthday by heading to Forest Park for Fair Saint Louis. Remember, Metro transit is a great option for those who are looking for a safe and convenient way to get to the festivities. Fair Saint Louis officially opens at 12 p.m., but you’ll want to get here early (around 7 a.m.) if you want to cheer on racers at the Freedom 4-Miler and Family Fun Run, which weaves through Forest Park. The 133rd Veiled Prophet Parade will follow afterward at 9:45 a.m. The live music starts at 12:45 p.m. with local artists KBeeta on the Budweiser Stage, followed by Dirty Muggs at 2:15 p.m. American rapper MC Lyte rounds out the afternoon at 3:45 p.m.
American soul and R&B artist Tony! Toni! Toné starts the evening performances off at 5:15 p.m. Morris Day and The Time follow after at 7 p.m., with Kool & The Gang ending this year’s fair at 8:45 p.m. 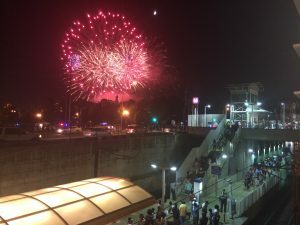 The three-day event concludes with the Enterprise Rent-A-Car/Edward Jones fireworks display at 10 p.m. Passengers returning to Illinois stations as well as all Missouri Blue Line passengers should use the Skinker MetroLink Station when leaving the fair. 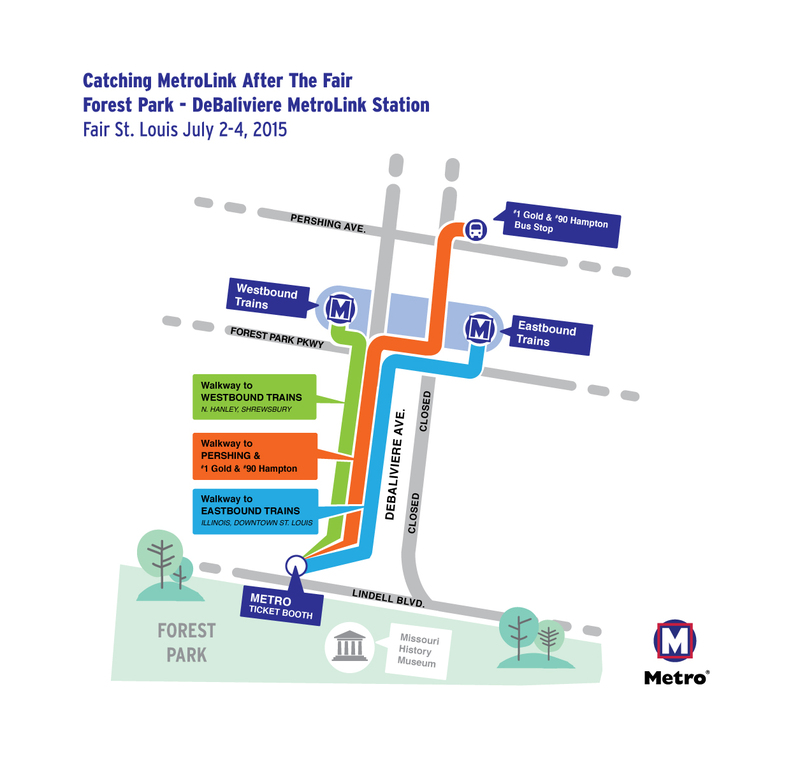 Missouri Red Line passengers should use the Forest Park-DeBaliviere MetroLink Station when leaving the fair. If you plan on leaving the fair using the Forest Park-DeBaliviere MetroLink Station, you will need to line up on DeBaliviere Avenue, just south of the station, north of the Missouri History Museum. The southbound lanes of DeBaliviere Avenue will be closed to vehicle traffic and divided into three paths for passengers and pedestrians. Passengers traveling westbound on MetroLink, toward Lambert Airport or Shrewsbury, will need to use the left walkway to access the westbound platform of the Forest Park-DeBaliviere Station. Passengers traveling eastbound on MetroLink toward Illinois will need to use the right walkway to access the station’s eastbound platform. The center walkway will allow pedestrians to cross over the MetroLink tracks and connect with Pershing Avenue and the bus stop on Pershing served by the #1 Gold and #90 Hampton MetroBus routes.